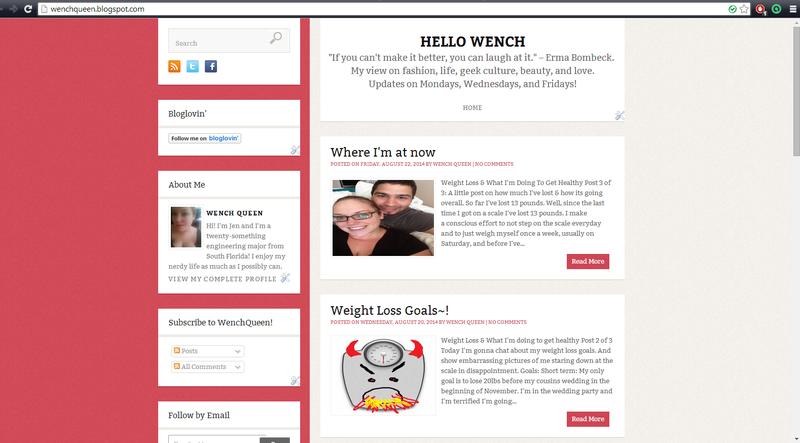 Hello Wench: Blog Overhaul Time! You know that feeling when you are tired of how your blog looks and are ready for an update? Well I'm at that point and am looking to overhaul my blog! I think when I started my blog I just picked something that I kind of liked instead of taking the time to actually work on my blog layout. And I know that a blog layout is actually fairly important for readers! I dont want a pastel (insert color here) blog. I feel like its not being true to myself if I just create a blog that caters to others and doesn't feel anything like me. I love science, beauty, videogames, and just LIFE. And what feels more like me than SPACE. It has seriously been an obsession and passion of mine for like, ever. I took a roadtrip to the Kennedy Space Center a little over a year ago and I had an absolute blast. I seriously wish I had the time to go back. My fiance has been lovely enough to help create a new galaxy theme in my favorite colors. I'm hoping to debut it on Friday! I hope you guys like it! True . . it is too easy to pick a viewer favourite blog design. I love the big social media follow buttons on your new one! Thanks! I figured since social media is such a big part of blogging, Why not make the buttons big? My fiance is also begrudgingly making everything for me. Haha! Thanks! I feel thats where I'm lucky, I have a tech background and my fiance is a Graphic designer. So through the two of us we can basically handle both ends. He does the pretty half and I do the coding half!